Since today is like the biggest day of the year for flower sales (I kinda made that up – or is it? ), I thought I would share my with you one of my favorite floral trends – live wreaths. All of these wreaths above are available from Williams-Sonoma. 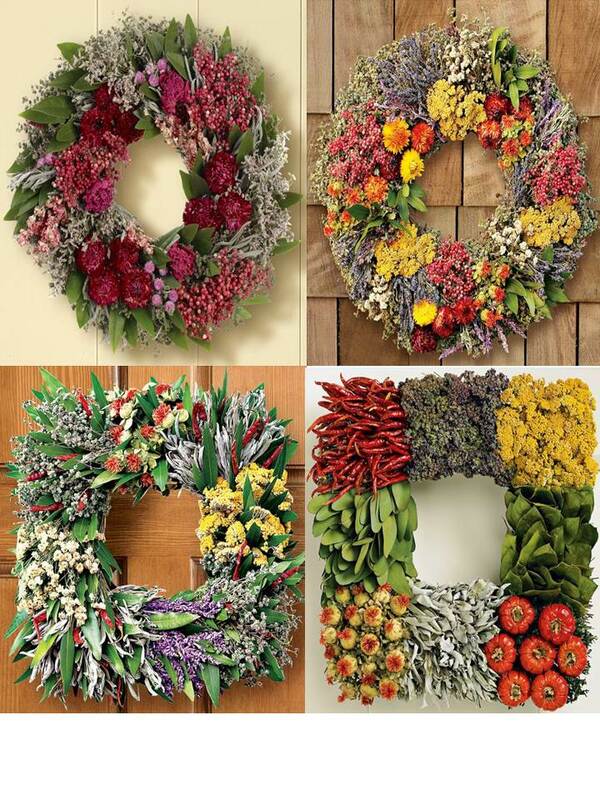 The care for these wreaths is simple – hang them up out of sunlight and let them age! Warning – some pieces may fall off, but that happens with a lot of wreaths, right!? The Farmer’s Market wreath (top right) includes goodies like dried flowers and fragrant herbs like blue lavender, purple sage, golden yarrow, orange sunflowers, thyme, safe and fresh bay leaves. The Culinary Wreath (bottom right) is perfect for a kitchen with cherry peppers, sage, bay leaves, red chilies and purple oregano (among other things!). And to make you love these even more, most are hand-made on a family owned farm! I have a bit of a personal war of the roses with flowers, but I’m warming up to them. I just think they are so pricey for something that doesn’t last!